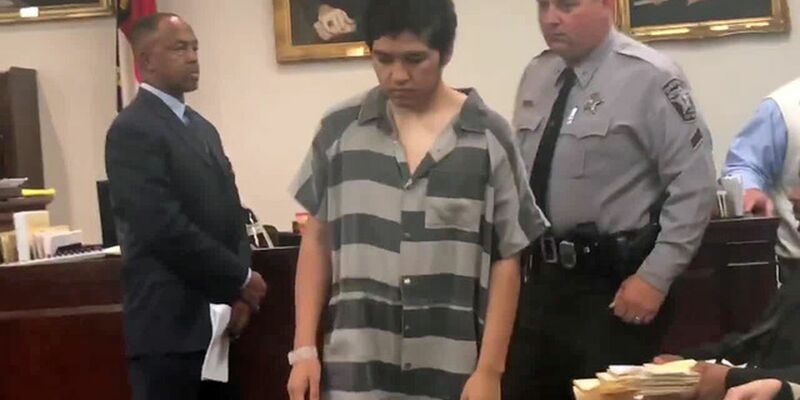 LOUISBURG, N.C. (WNCN) - The Franklin County man charged with decapitating his mother in March 2017 was found not guilty by reason of insanity. Oliver Funes-Machado, 20, is accused of beheading his 35-year-old mother on March 7, 2017, then walking out of their home with her head in one hand and a butcher knife in the other to wait for deputies to respond to the 911 call he made. On Monday, a judge ruled that although Machado is now competent to stand trial, he was insane at the time of the crime. He will be committed to a mental health facility in the state. Machado told dispatchers he had killed her "because I felt like it," according to an investigator's sworn statement. The teen's 4-year-old sister and 2-year-old brother were in the house, the statement says Machado told dispatchers. Prosecutors said in May 2017 they would not seek the death penalty. The teen's attorney, Boyd Sturgess, said at the time that his client is a "very unwell person" and that "mental health is going to be a key component" in the case. “I think just from what we’ve seen it clearly appears to be the kind of a case that has a serious component of mental health disorder of some sort. I am not a doctor, and neither is the district attorney. Clearly, this is not your run of the mill occurrence,” he said.